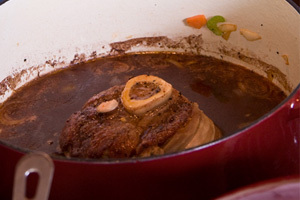 are six basic steps to braising Osso Bucco (be it grain-fed veal osso bucco, venison osso bucco, or antelope osso bucco). What follows isn’t a recipe, per se. It’s more of a how-to…the general technique and ideas of improvisation. Aside from the braising liquid of your choice (check out these braising liquid recipes), you’ll need a dutch oven or some sort of cookware that you can use on the stovetop and in the oven. Though it takes a few hours to braise osso bucco, only about 25 or so minutes of work is involved…the rest is just slow cooking in the oven. 1. 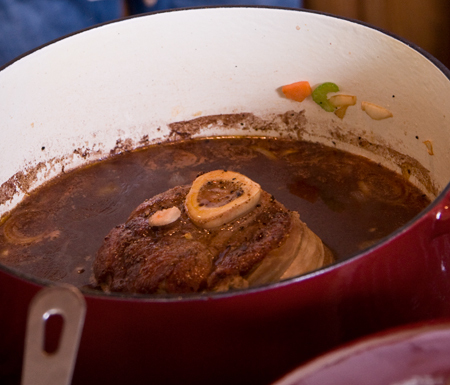 Pat the osso bucco dry. 2. Season the meat with salt and pepper. 3. Sear the meat for about 3 minutes on each side in a hot pan with a high temp oil, such as canola, peanut, grapeseed, or clarified butter. You’ll know the meat is seared when it releases easily from the pan and has a nice brown color. Searing the meat before braising carmelizes and adds texture. 4. Once seared, remove from pan. 5. Make the braising liquid. 6. Transfer braising pan to oven at 325 for about 3 hours, or until the meat is fork tender.